“What I’m interested in are images. I’m sure you can tell. 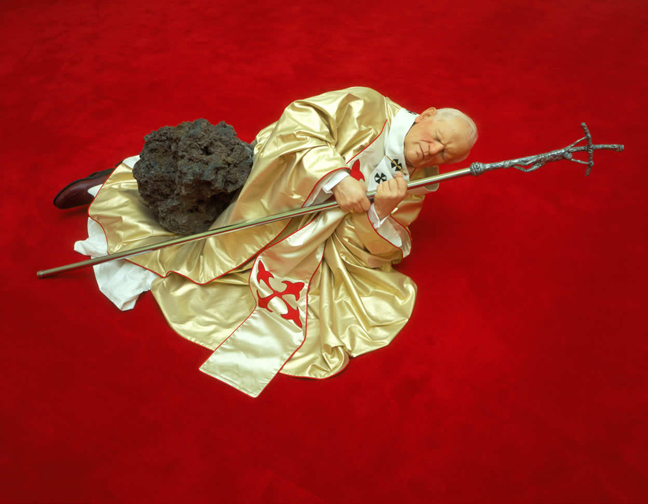 Who in his right mind would deliberately represent the pope struck by a meteorite in order to deliver a political message about the church? Or a hooded kid nailed to a school desk? It takes a very deviated and imaginative mind – say Roger Waters in his The Wall period – to conceive something like that as a critique of the educational system”. The author of this quotation and of the two aforementioned artworks La Nona Ora (The Ninth Hour), 1999 and Charlie don’t surf, 1997, is no other than the court jester of the art world, Maurizio Cattelan. Unsettling, unconventional, witty, full of humor, varied and with no limits, is how the art scene’s joker’s work could be described. 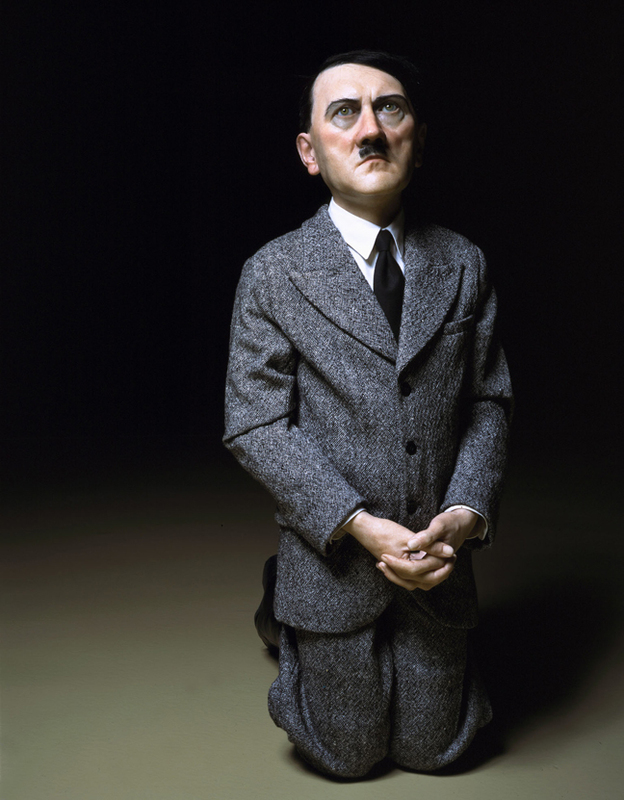 Born into a poor family in 1960 in the city of Padua, Cattelan had an unhappy childhood and the routine of his menial jobs while he was a young man contributed to an outlaw distrust of authority and to the beginning of his career as an artist. Cattelan’s art makes fun of various systems of order – be it social niceties or his regular digs at the art world – and he often utilizes themes and motifs from art of the past and other cultural sectors in order to get his point across. Cattelan saw no reason why contemporary art should be excluded from the critical spotlight it shines on other areas of life and his work seeks to highlight the incongruous nature of the world and our interventions within it no matter where they may lie. His work was often based on simple puns or subverts clichéd situations by, for example, substituting animals for people in sculptural tableaux. Frequently morbidly fascinating, Cattelan’s dark humor sets his work above the simple pleasures of well-made visual one-liners. His themes can vary from escapism to childhood to thievery and his work are full of references to the post-war art and culture blended with the artist’s own idiosyncrasy. 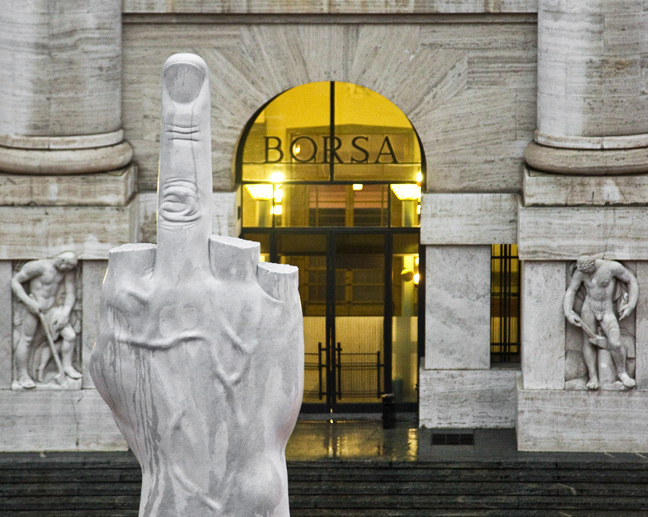 Self-mockery is repeatedly used by Cattelan through his own image but his criticism does not spare anyone. 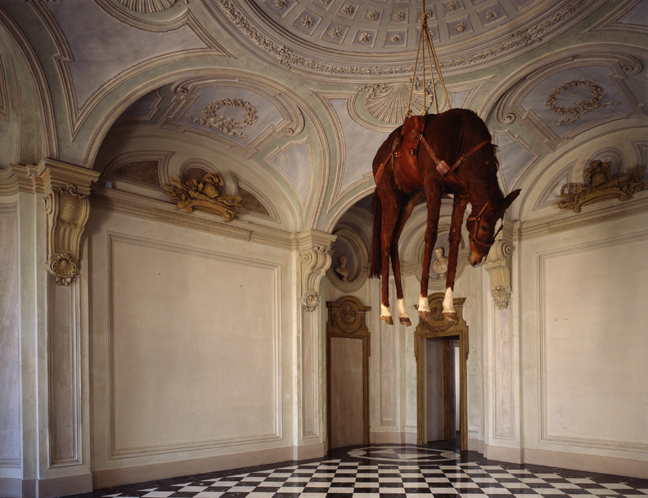 Described by Jonathan P. Binstock, curator of contemporary art at the Corcoran Gallery of Art “as one of the great post-Duchampian artists and a smartass, too”, Cattelan has no formal training and has always considered himself an “art worker” rather than an artist. His work has been on view in numerous solo exhibitions such as the Centre Georges Pompidou in Paris, the Museum of Modern Art in New York. His work has been included in every Venice Biennale since 1993 and in major venues worldwide like the exhibitions at the Tate Gallery in London. 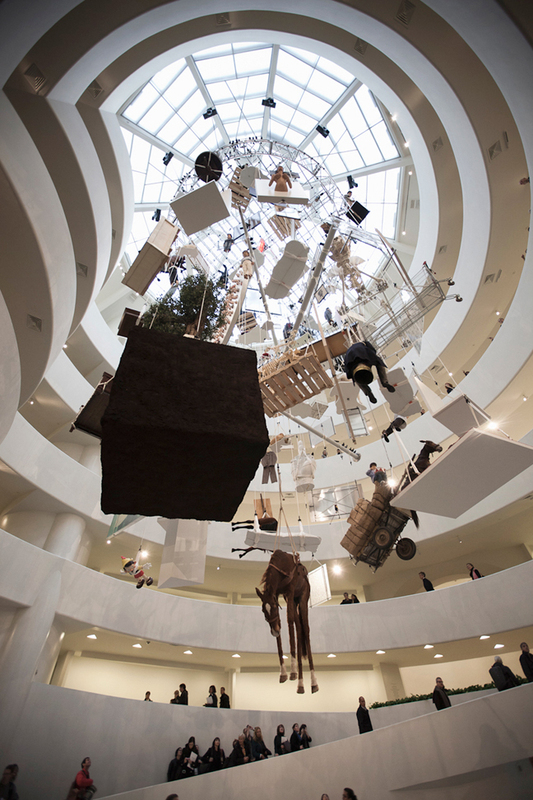 A major retrospective, assembling 130 objects of Cattelan’s career since 1989, has also opened in 2011 at the prestigious Solomon R. Guggenheim Museum in New York. Despite his legendary career, the best-know Italian artist likes to insist: “I really don’t consider myself an artist. I make art, but it’s a job. I fell into this by chance. Someone once told me that art was a very profitable profession, that you could travel a lot and meet a lot of girls. But this is all false; there is no money, no travel, no girls. Only work. I don’t really mind it, however. In fact, I can’t imagine any other option. There is, at least, a certain amount of respect. This is one profession in which I can be a little bit stupid, and people will say, ‘Oh, you are so stupid; thank you, thank you for being so stupid” (Nancy Spector in Conversation with Maurizio Cattelan).